In a personal training program, you will not only be able to customize a workout program based on your current fitness level. You will also be learning the right ways to achieve your fitness goals such as losing weight or staying in your best shape. A certified personal trainer will teach you the right wxercise routines in toning your muscles from top to toe in the most effective way possible. Your trainer aill also be responsible in making sure that you are working out in proper form keeping you from experiencing pain or, worse, injury. It is also part of his or her job to strategically develop a workout program that you can stick with, motivating and challenging you in the process as you progress to the next level of your personal training. Knowing that someone makes time to check on you will make you less likely to skip a session. Being in a personal training program in Canton, MA lets you sculpt your muscles from head to toe, It works effectively in burning the extra fat in your body and spiking its process to convert stored fat to a useful energy. A training can be specifically designed to prepare you for a sports tournament or for a special event. 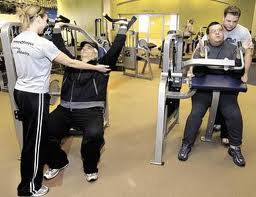 Consult a an experienced trainer about what to do to stay strong and in shape. For more details, contact Answer is Fitness.